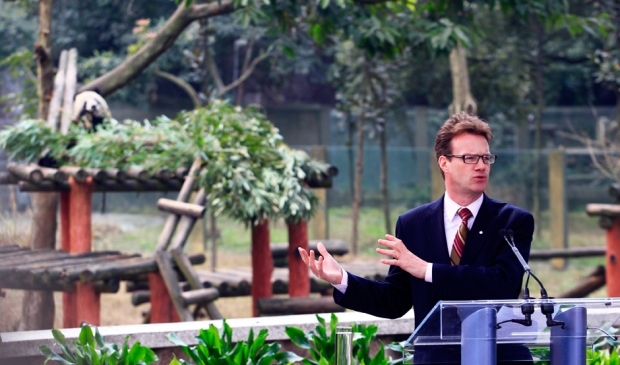 Mark Rowswell, cultural ambassador between China and Canada, during the signing of an agreement on giant pandas between China and Canada at the Chongqing Zoo on February 11, 2012. If you are a long-timer in China, this is a show that needs no introduction. One of the most famous foreigners in China, Mark Rowswell (a.k.a. Dashan), shot to fame in the early 1990s after a fortuitous break on Chinese television. In this live interview with David Moser, conducted at Capital M earlier this month, David and Mark talk a bit about their shared experiences on Chinese television before some light sparring in a deeper discussion of how Chinese media and the Chinese sense of humor have changed over the years.